Join us each month for a review of a book pertaining to marriage, dating, family life, children, parenting, and all other things For Your Marriage. 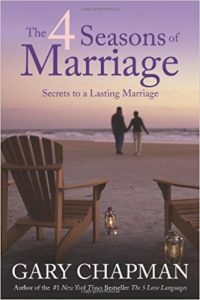 “Every marriage is still in process,” says Gary Chapman. In The Four Seasons of Marriage, he describes how marriages commonly move from one season to another – from summer to fall or perhaps from winter to spring. He differs from some writers, however, in holding that each season may repeat itself numerous times over the long course of a marriage. “My experience, both in my own marriage and in counseling couples for more than thirty years, suggests that marriages are perpetually in a state of transition, continually moving from one season to another – perhaps not annually, as in nature, but just as certainly and consistently. The cycle repeats itself many times throughout the life of a marriage,” Chapman says. After analyzing each marriage season, this easy-to-read book presents “seven strategies to enhance the seasons of your marriage.” Chapman describes these as “biblically based strategies” that grew out of his extensive counseling experience. Chapman is very widely known for his best-selling book The Five Love Languages. He is a Baptist pastor in North Carolina and has counseled a great many married couples. When a fall or winter season occurs for a couple, the spouses tend to feel uncertain or less hopeful about where their marriage is headed. The presence of these seasons needs to be addressed by couples, Chapman believes. “The seasons of a marriage do not typically change without some positive action — unless it’s a change from bad to worse,” he writes. Chapman devotes considerable attention to attitudes that either benefit or harm marriage. “As long as we rationalize our negative attitudes as legitimate, they will never change,” he advises readers. “If, however, we are tired of winter and would like to feel the hope of springtime again, we must recognize that our negative thinking must change.” How will this change be made? Chapman offers practical action steps for changing negative attitudes. David Gibson served for more than 37 years on the Catholic News Service editorial staff. Disclaimer: Book reviews do not imply and are not to be used as official endorsement by the USCCB of the work or those associated with the work. Book reviews are solely intended as a resource regarding publications that might be of interest to For Your Marriage visitors.